The focus and work of years was seemingly coming to its climax. The bold announcement at the beginning, the gathering of his co-workers, the teaching and the mighty works, and then the growing tension and hard confrontations—all of the lines were coming together to reach their single goal. The work of Jesus was coming down to this, his last few days. What would his final act look like? What would he do? Would he meet the expectations of the crowds? Of his own closest followers? He had set his countenance and his feet straight for Jerusalem—so what did he have in mind? Whatever the central meaning of his life and ministry, it would have to show itself right now. This was Jesus’s moment, if he was going to have one. And it was not a simple one. From his birth right through to his final entry to Jerusalem, Jesus has been evoking numerous strands of Israel’s long and pregnant story. There are rich layers of significance that precede this week. Will all those promises of meaning be kept? From his birth right through to his final entry to Jerusalem, Jesus has been evoking numerous strands of Israel’s long and pregnant story. For too many of us, these Holy Days have been reduced to one day—Good Friday—and to a single assigned meaning of that day. Now the death of Jesus on a Roman cross is certainly not less than this. But it is also so much more. There is a profound loss when we minimize the meaning of the crucifixion to my salvation, especially when I conceive of this saving merely as an escape to heaven when I die. In such a reduction we shortchange the gospel and shrink the impact and import of all that Jesus has accomplished. How do we avoid this? As with so many things in the Christian life, a healthy recovery can be found when we return to the Scriptures. The fullness of Holy Week is found in the fullness of the Bible’s telling of the story. A renewed commitment to understanding the narrative as it unfolds in the Gospels will pay multiple dividends in appreciating the depth of the Passion drama. The Gospels, like other books in the Bible’s library, should be read whole. Their telling of the end is embedded in the context of what they’ve been saying along the way. The Evangelists build their stories of Jesus intentionally, so each Gospel gives us a unique angle on the life and meaning of Jesus. We could appropriately pick any of the four Gospels to help us in this restoration, for they each lead us up to this momentous last week in their own way. Light breaks on the first day of the last week. Jesus has spent his entire ministry focusing on the kingdom of God. It is the theme par excellence of all his previous efforts. Now Jesus clearly calls up echoes from Israel’s royal history (from Saul to Solomon to Judas Maccabeus) to boldly embody the coming of the King himself into David’s city. Jesus’ prophetic announcement of God’s return here transforms into an explicitly messianic claim. So the stage for the week is set: Jesus is Israel’s king. But what kind of king is he? Jesus has entered the city, but now his focus turns exclusively to the Temple. Why is the Temple at the center of Mark’s story here? Why does Jesus curse the fig tree? What is he looking for? Why does he immediately enact a parable of the Temple’s destruction? What is the point of his quote from the prophet Jeremiah? Mark now spends more space describing the events of Tuesday than any other day of this week. What’s happening? Jesus is clearly and strongly confronting those who govern the affairs of the Temple and make up Israel’s supreme ruling body. The rulers, for their part, directly challenge Jesus’ authority. The clash that’s been long brewing in the ministry of Jesus is now coming to a head. Then the parables and provocations of the day culminate in a troubling prediction of the physical dismantling of the Temple within a generation. (It’s important to pay attention to literary form here, recognizing prophetic metaphors and apocalyptic language.) Israel’s story has reached a major turning point, and it is centered on Jesus. There are two contrasting responses to Jesus here, an act of adoration surrounded by two references to betrayal. Jesus forces choices even as he is preparing for his own death. So Jesus has chosen Passover, Israel’s great liberation event, as the backdrop to provide the meaning of his next action. Jesus claims to be bringing an Exodus, a new freedom movement. What were the elements of the first Passover and the original Exodus? Are all those elements to be found here as well? Jesus has now fully entered into the trial—the time of great tribulation and testing that the Jews knew would precede their full redemption. He is convicted twice, by both Jewish and Roman tribunals. Of what specifically? What do the differing charges tell us about Jesus and his work? So Jesus is condemned to death, precisely as the King of the Jews. What have the week’s events, all of them carefully chosen by Jesus himself, told us about what Jesus thought his death meant? Is his death more than a sacrifice? How can it possibly be a victory? As Jesus journeyed through the week, he was surrounded by symbols and echoes of Israel’s story. His recapitulation of them was not a mere repetition, but rather filled them with new and surprising meaning. Now, on the seventh day, he rests in death. What has been accomplished? If Israel’s story was always all about the world’s story, what does the resurrection of Israel’s Messiah mean for the rest of us? What does an echo of the creation story imply? We have seen the birth of a new kind of king and a new kind of Temple. And I hope we are waking up to the possibilities of a new kind of kingdom and the renewal of worship. The powers who ran Israel’s first-century world—both Jewish and Roman—knew and followed only one model for ruling. Jesus came into the city having staked his life and his chance at victory on a completely different vision, one centered on the power of self-giving love. Yes, Jesus died for me. But my place is found only in a much bigger and better story than my own small tale. You, me, and all of us are called to take up our place in God’s transforming work. And the only place we learn the ins and outs of God’s holy work is in God’s holy book. The way to avoid shrinking reductions of biblical truth is nothing other than a rediscovery of the fullness of the Bible own tellings. Read big. Read in context. Make connections. Every single bit of the Bible was written to people from another time and place. Therefore, exactly 0% of the Bible was originally addressed directly to you or to me. The fact is that many of the shorthand descriptions we commonly hear about the Bible just don’t accurately capture what the Bible is and how it actually works. And that’s too bad, because the way the Bible was built to help us remains undiscovered. The common descriptions often lead to confusion, distortion, and misreading, while the real benefits of these sacred writings remain undeciphered. The key to finding the Bible’s purpose for us is first and foremost to be honest about the nature of the Bible itself. Grasping a handful of basic points will put us well on the way to a healthy and beneficial interaction with the Bible. We begin with a full acknowledgment that the Bible is rooted in an ancient world. It is speaking directly to people in that world, not our world. Now it’s true that some things stay the same over the course of history, like the basics of the human condition. So the Bible will always be relevant in that sense. But it’s also true that a lot of things change, like the cultural frameworks that shape how people see their world and make sense of it. The Bible is not trying to be modern (or postmodern). It’s simply trying to be what it is—an account of the beginning of God’s interactions with a family-turned-nation that is crucial to accomplishing his intentions for the whole world. So we must begin our Bible reading by doing all we can to understand what it is saying to those people first of all. What were the assumptions of Israel’s ancient world? How does the Bible both reflect and challenge those assumptions? The next step is to realize that the Bible is not really a single book. It’s a collection of very different kinds of writing that were spoken, sung, written, and edited over a long period of time. A critical element of good Bible reading and interpretation is to ask: What kind of book is this? and What are the rules for understanding this kind of writing? The ancient Hebrews used lots of kinds of literature, and there are regular rules of engagement that go with each one. A failure to attend to them can easily lead to misreadings of lyrical poetry, wisdom literature, prophecy, apocalyptic, letters, and even historical accounts (which functioned with ancient standards of history writing, not modern ones). But the Bible is not a random collection of ancient Hebrew writings. The Holy Scriptures are a library whose contents come together to tell a single, connected story. There are narrative threads that tie the books together, progressively revealing more and more of God’s slow and patient plan to reclaim his creation. That is, there is redemptive movement through the books over time. This movement is not always smooth and easy, effortlessly gliding toward God’s final intentions. Rather, the story moves in fits and starts, with huge setbacks and failures that lead to real questions about how God’s big plan is working. Later this month I’ll be speaking at a seminar taking a deep dive into how the story of the Bible works. The seminar is free – click here to learn more and register. One of the burning questions for first-century Jews was precisely this issue of God’s faithfulness to the covenant and the fate of his chosen people. For centuries the story had appeared to be stuck. Is this story even true? But the New Testament claim is that the utterly surprising story of Jesus reveals God’s remarkable work to save the story and rescue the world. The Bible itself claims the story has a beginning, a long meandering middle, and an ending that will embody God’s longtime intentions. So the way to read the Bible is to feast on whole books, understood as the literature they are and speaking to the Bible’s first audience, while staying aware of the place the various books take within the developing narrative. Sometimes it is objected that the “Bible as story” approach is overdone since not all the Bible’s books are narrative in form themselves. But this objection misunderstands how the books fit together. Of course it’s true that many contributions within the Bible are something other than narrative—there are song books, proverbs and longer wisdom reflections, apostolic letters, law codes, collections of prophetic oracles, etc. But the point remains that all of these other kinds of writing adorn the Bible’s narrative by adding depth and color, allowing us to see and feel more deeply what it was like to live within this story of God and his people. The non-narrative books of the Bible offer crucial ways for us to enter more deeply into the story and understand it from the inside out, in greater detail and texture. These books open up what it was like for ancient Israelites or early Christian believers to live out God’s story in the real world. The “festoon” books allows the Bible to show and not merely tell what this great drama is all about. So, putting it all together, the good news is that we don’t have to pretend that we’re supposed to read the Bible and simply do everything it says. God has never wanted us to be robots. Instead, God gave us the wonderful gift of the Bible so that we can see what he’s done throughout history and absorb the story deep in our bones. And he’s trusted us to faithfully carry the story forward today. How do we do that well? First, we have to ask what any particular part of the Bible meant to its first audiences. We explore how it contributes to the ongoing story: What new thing is happening? or What’s going wrong here in terms of where God wants the story to go? Then, once we’ve done our due diligence on what the Bible meant, we can proceed to what it means—for us, now. We do this by reflecting on that original meaning and looking for connections to our life now. What perennial human tendencies, weaknesses, temptations are addressed? What signs do we see of God’s ultimate redemptive intentions? What do we learn about how God works? And finally, preeminently, we watch explicitly for how Messiah Jesus is at the center of the story. It is in his life and ministry that we see what the world looks like when God rules. Not everything that God will accomplish in the end was completed during Jesus’ life, but in him we do see most clearly who God is, what he wants, and what the central trajectory of the story is. And it’s in that redemptive, restorative trajectory of new creation that we live. Our job is to read the Bible thoroughly and well so we know what God has done and what God is doing. Our work is to labor alongside God himself, making our own contribution to his kingdom coming on earth as it is in heaven. And the only way we can know and do such things with competence and clarity is by reading and living the Bible well. Want to learn more about the story of the Bible and how we can live it today? Register for our free seminar later this month. If you live in the Colorado Springs area, join us at the live event. If not, you can still register and receive a video recording. From time to time we’ll share some of the interesting and thought-provoking content from around the Internet that we come across during our work. Enjoy! *Note: Sharing doesn’t necessarily imply 100% agreement with the article or endorsement of the author. Research proves time and time again that most people prefer reading print books, but the convenience and portability of cell phones has led lots of people to start reading books on their device. This fun article outlines how one publisher is still tinkering with print design to meet modern needs of portability while pushing for the best possible reading experience. Living in the Age of Information tempts us to reduce the Bible to a trove of information that must be parsed and analyzed. In this interview with Joel Green, Dean of the School of Theology at Fuller Seminary, Green shares how reading fiction like The Lord of the Rings shapes how he reads the Bible. There’s a lack of imagination within the evangelical church, he says, and it’s been replaced with logic and propositions and syllogisms. Reading fiction and fantasy opens up a different part of our brains and unlocks our imaginations to experience wonder and emotionally respond to what we read. All of which are valuable skills for reading the Bible. In this brand-new podcast, renowned New Testament scholar N. T. Wright fields questions from listeners on a variety of topics from the atonement to the historical Jesus to the reliability of the gospel accounts. Wright is able to explain complex theological concepts at a very accessible and non-technical level, and takes listeners into the world of ancient Judaism and the first-century church. Here’s a small sample, and you can view a few more video samples of the podcast here. Eugene Peterson didn’t give us the Message per se. The Good News itself preceded him. But Eugene did grace us with a rendering of the Bible that woke us up, causing us to take notice of the startling, disruptive power of these holy words all over again. Eugene knew from teaching Sunday School in church that we are all susceptible to the Holy Bible doze. He was teaching Galatians and folks were stirring their coffee, nodding off. He was astounded. Galatians! Paul is so angry he’s swearing, and people are bored and mentally wandering away? So, yes, The Message was a gift. The God-given words of grace, gracefully written. A presentation of the Bible to make us think again about what we thought we already knew. It helped us feel again what words with power can do. It made the case for the Bible not by arguing for it, but simply by embodying the Scriptures as a speech act—words that do more than stand around shuffling their feet on the page. These were words to accomplish things, executing God’s own actions in us and for us by promising, convicting, healing, and restoring. 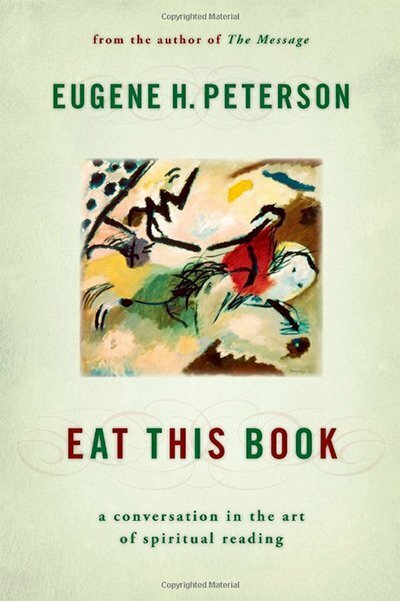 Eugene Peterson gave us back the Bible, made fresh. Living and active, fully in the present tense. But there’s more. Eugene also wrote about the Bible and our reading of it. The point, he said, is not just to read it, but to read it for living. “What I want to say, countering the devil, is that in order to read the Scriptures adequately and accurately, it is necessary at the same time to live them.” In Eat This Book, which he subtitled A Conversation in the Art of Spiritual Reading, we find all the elements of good reading laid out plain and clear. “Story is the primary verbal means of bringing God’s word to us. . . . Unfortunately, we live in an age in which story has been pushed from its biblical frontline prominence to a bench on the sidelines and then condescended to as ‘illustration’ or ‘testimony’ or ‘inspiration.’ Our contemporary unbiblical preference, both inside and outside the church, is for information over story. Eugene Peterson gave a good portion of his life’s work to bringing the Bible to us in “American”—in distinctly American language and addressing particularly American ways of misconstruing the world. For him, pastoral work was always local, but we can be thankful that the size of his parish increased over time, benefiting us all. Eugene exerted himself greatly, deploying his love of language and the Scriptures to invite us all back into the bigger, grander, hope-filled world of the Bible. Rest well in peace, Eugene. We’ll express our gratitude to you properly when we all rise together at the great resurrection.